The Wall Street Journal ran this article a few weeks ago on Minestrone, including 3 delicious-looking recipes. 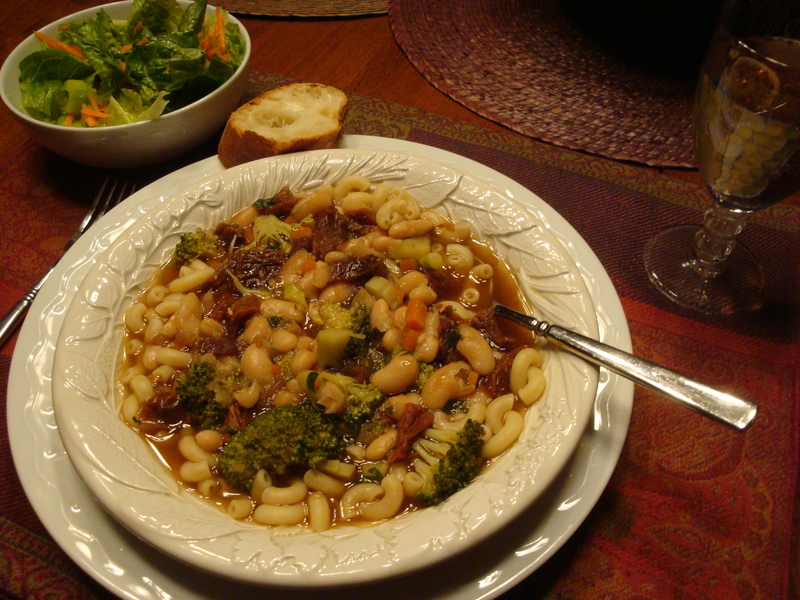 I love making Minestrone and the message and recipes here expanded my thinking as to what this soup is all about. I love the quote “But minestrone is, ultimately, a hyper-personal and hyper-seasonal chameleon of a dish, tailored to the current harvest and the cravings of the maker. This soup embodies better than any other the enviable Italian virtue known as sprezzatura: an artful effortlessness.” When Randy and I were talking Sunday morning about what we’d like for dinner, he said he had bought the ingredients for this soup. I had planned to make roasted salmon, potatoes and broccoli, but given I had a cold, the Minestrone sounded way more appealing. Plus I didn’t have to cook – what’s not to like?! We both had seconds of this! 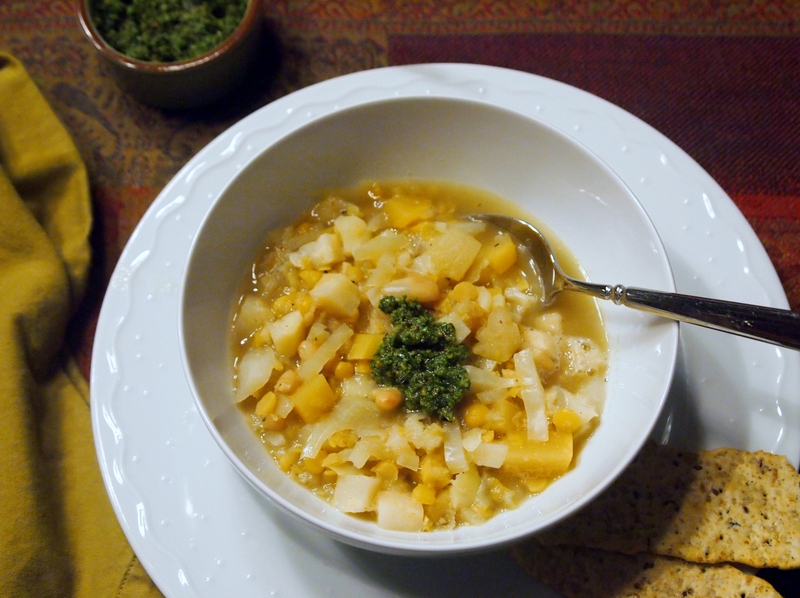 Like many “ugly duckling” soups and stews that we’ve posted before (like this, this this and this), don’t let the bland look turn you away – this is one delicious soup, made even better by the unusual pesto. Guest chef Randy Tatum says . . . This recipe looked like an interesting use of seasonal ingredients, including celery root which I don’t cook with enough. I thought the soup could use even more winter vegetables, so I added rutabaga. I found this easy to make, even if it takes a little chopping. It’s one of those dishes that can really be flexible in terms of ingredients and quantities. Unlike Suzy, who always has flavorful homemade chicken stock in the freezer, I take a rather relaxed approach to creating a stock for my soups. It’s called Better Than Bouillon Chicken Base and is a more than acceptable substitute. I often use their “No-Chicken Base”, which tastes just as good but is vegetarian. The pesto is indeed unusual and I agree that it really adds to the finished product. Place the yellow split peas in a small saucepan and cover with water. Bring to a boil, then turn down heat and simmer for 20 minutes. Set aside. Meanwhile, heat the olive oil in a large pot over medium heat. Once oil is warm, add the onions and cook, stirring occasionally, until soft and translucent and just beginning to brown, about 8 minutes. Stir in the garlic and cook till fragrant. 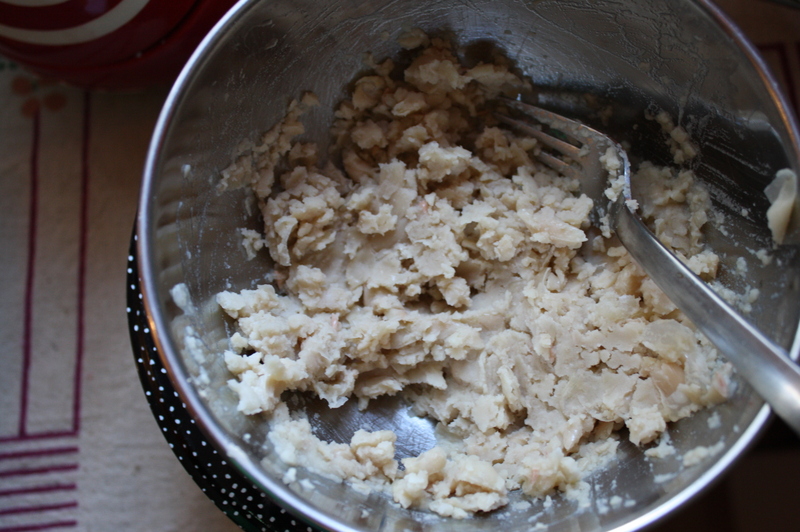 Stir in celery root, parsnip and rutabaga, cooking until fragrant, another 5 minutes. Add the stock, bay leaves, beans, split peas, cabbage and apple. Stir to combine. Reduce heat to medium-low, cover pot and simmer gently until celery root, parsnips and rutabaga soften, about 30 minutes. Season to taste with salt and pepper. Cook the pasta to al dente according to instructions. Drain and set aside. Meanwhile, make the pesto. In a food processor, purée the greens, pecans, rosemary, whole garlic cloves, oil and a pinch of salt until mixture is reduced almost to a paste. Turn into a serving dish. 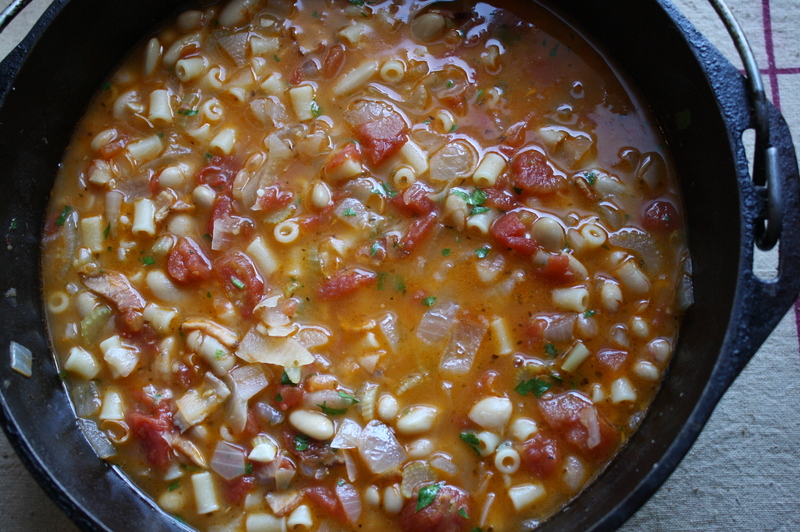 To serve, place desired amount of pasta into a soup bowl. Ladle as much soup as you want onto the pasta. Place a dollop of the pesto onto the soup and stir to blend. Enjoy! When it’s -5 degrees F when I wake up, soup comes to mind! I’ve been fairly obsessed with soup these days. We’re having a colder and snowier than normal winter here in Minnesota which means soups and stews have a prominent place on our menu. 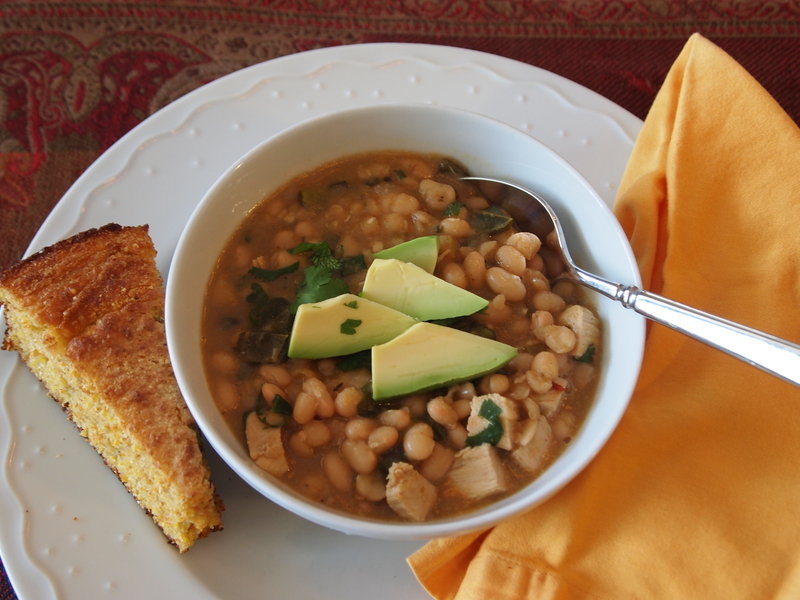 I was looking for a new recipe yesterday and found this one in a cookbook on my shelf – A Good Day for Soup. It caught my attention because I don’t think I’ve ever made a soup with broccoli and our sage plant is going wild with new leaves. 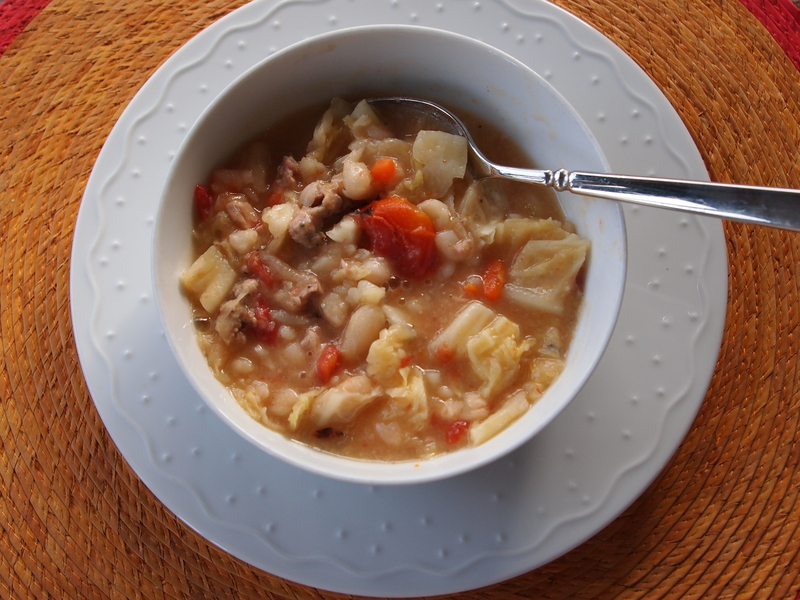 I made a couple of adaptations to the recipe, taking a page from the White Bean and Rosemary soup recipe we posted in the fall. Specifically, I made a sage oil to drizzle over the finished soup and served the soup over pasta. Like that soup, this one can be made vegetarian by using 100% water rather than a combination of water and chicken stock. We served this with a salad, baguette and a flavorful Pinot Grigio, which paired beautifully. If using dried beans: Prepare the dried beans by soaking overnight or using the quick-soak method (place in a pot, cover by 3 inches with water, bring to a boil, remove from heat and let sit for an hour). Prepare the soup base by sauteing the onion and carrot in the olive oil for about 5 minutes in a large soup pot or Dutch oven. 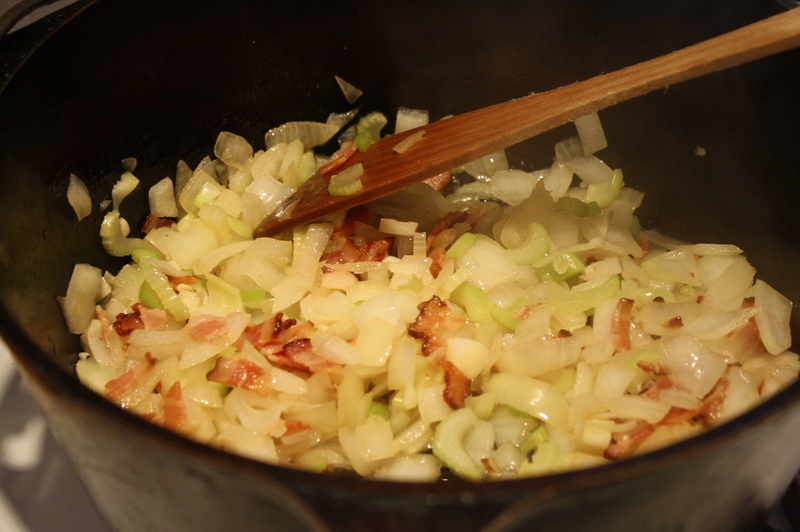 Add the garlic and saute for another minute or two. Add the sage and cook for another 2 minutes. Add the liquid and the prepared dried beans. Bring to a boil, add the parmesan rind, turn down the heat and simmer for 40-60 minutes till the beans are done but not mushy. If using dry sundried tomatoes (which I recommend), add the chopped tomatoes in the last 10 minutes of cooking. (If using oil-packed sundried tomatoes, rinse and pat dry before chopping, then add along with the broccoli.) Add the broccoli, bring back to a simmer and cook 5-10 minutes. Check after 5 minutes – the broccoli was cooked to our taste after that time. Stir in the parsley just before serving. 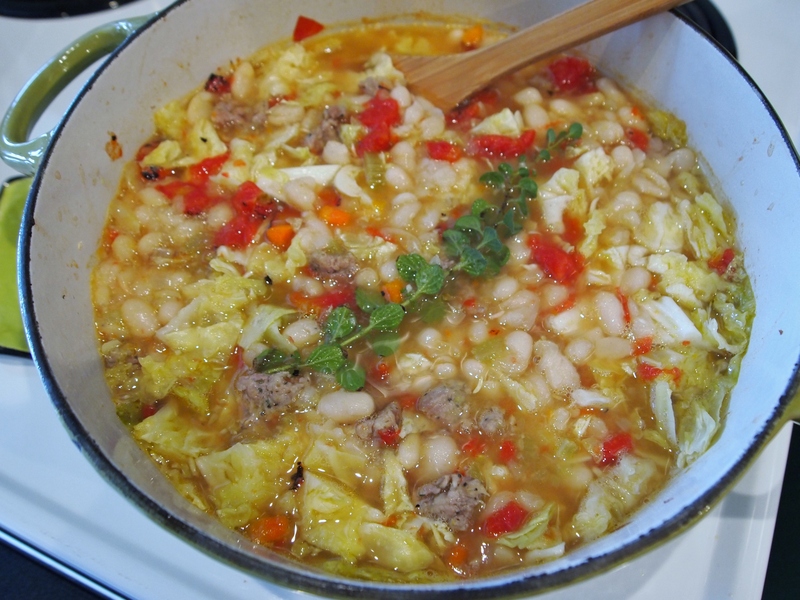 If using canned beans: Create the soup base, add the liquid and the cheese rind and simmer this for 30 minutes to develop flavor before adding the canned beans and the sun dried tomatoes. Then cook for another 10 minutes before adding the broccoli. To serve the soup: Place a little pasta in the bottom of the soup bowls. 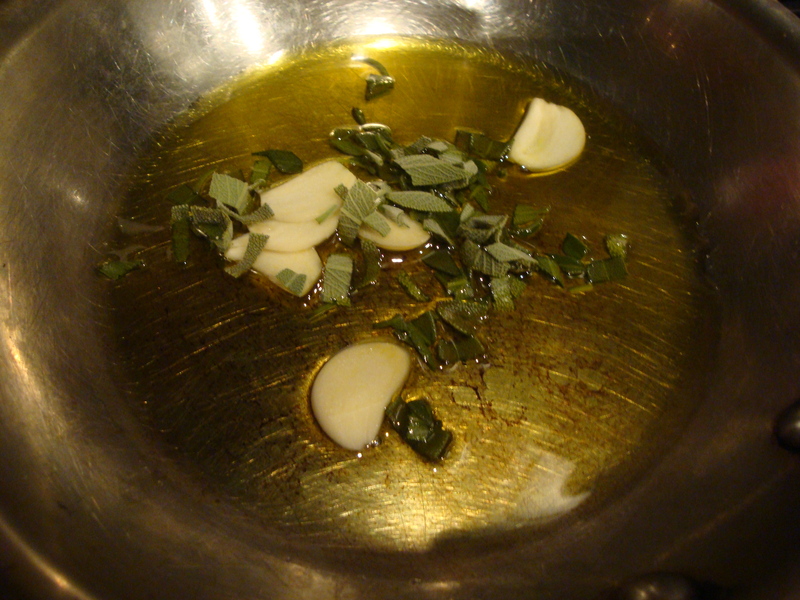 Ladle the soup over the pasta and drizzle with a little sage oil. Place these ingredients in a small pan over medium heat. Keep the pan on the heat until the oil starts to bubble. Remove from heat and let sit 15-30 minutes. Strain into a small bowl for serving. 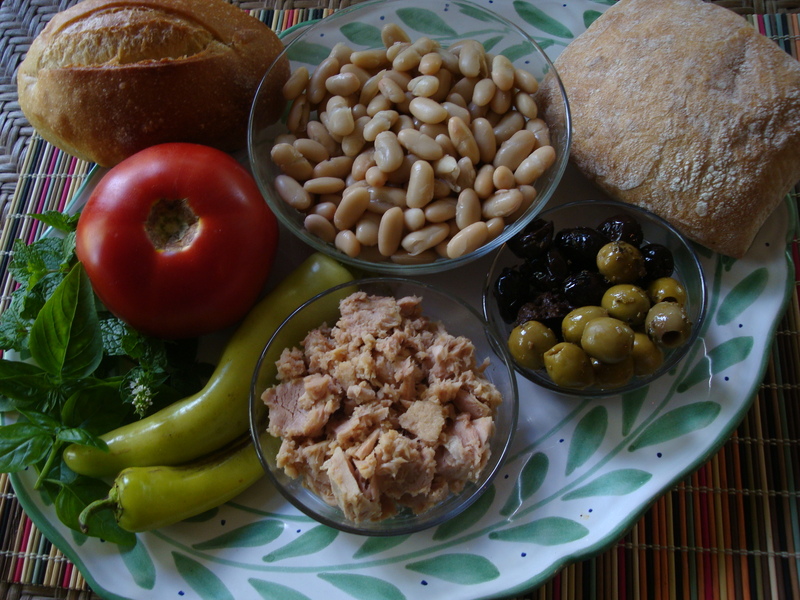 Another great no-cook recipe to beat the heat! Salon.com has a recipe contest every week called Kitchen Challenge. Two weeks ago the theme was “your tastiest raw tomato dishes” and this recipe was chosen as the best. It caught my eye because it used many of my favorite ingredients all put into a sandwich – and it comes with a great story! This is the second time we’ve made it – and we might make it again this summer as long as the tomatoes are so delicious. This is one of those recipes that you can add or subtract the ingredients you use to your taste. For example, we did not use the hard-boiled egg and we added sliced Hungarian peppers to give it a little zing. 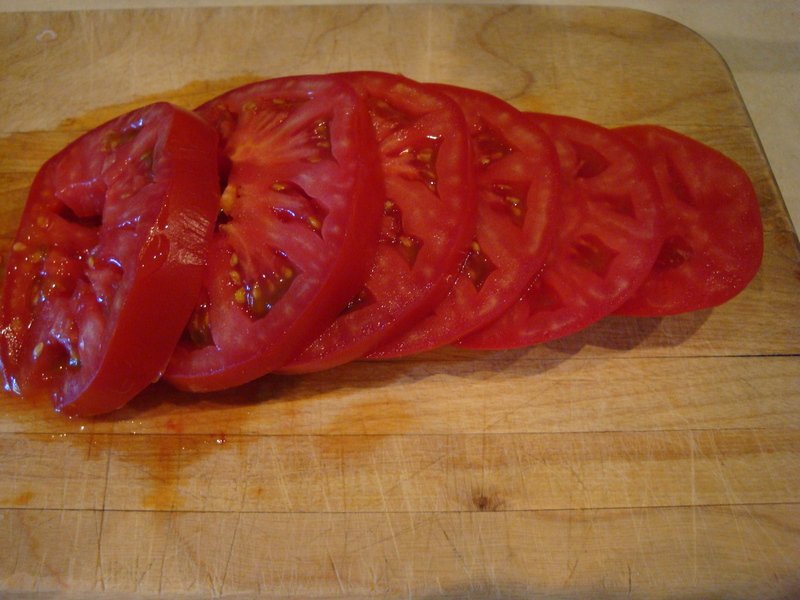 I know that many people are growing and buying heirloom varieties (which I love), but I must say a classic red, round homegrown tomato will be the ticket for this recipe. We served it with both a Spanish Rose wine (last time) and yesterday with a white Cotes du Rhone. Slice the bread in half and toast to desired doneness. Sprinkle each side with a little olive oil. Put all or some of the ingredients on the bread in any order that you want. Dig in!! Here’s a pic of my sandwich using a sourdough roll from Trader Joe’s. 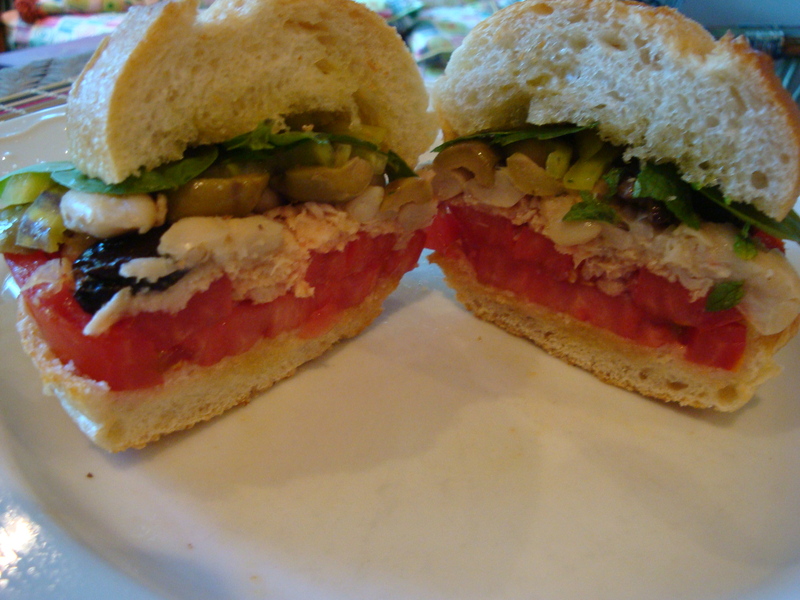 And below is a photo of Randy’s sandwich on ciabatta. 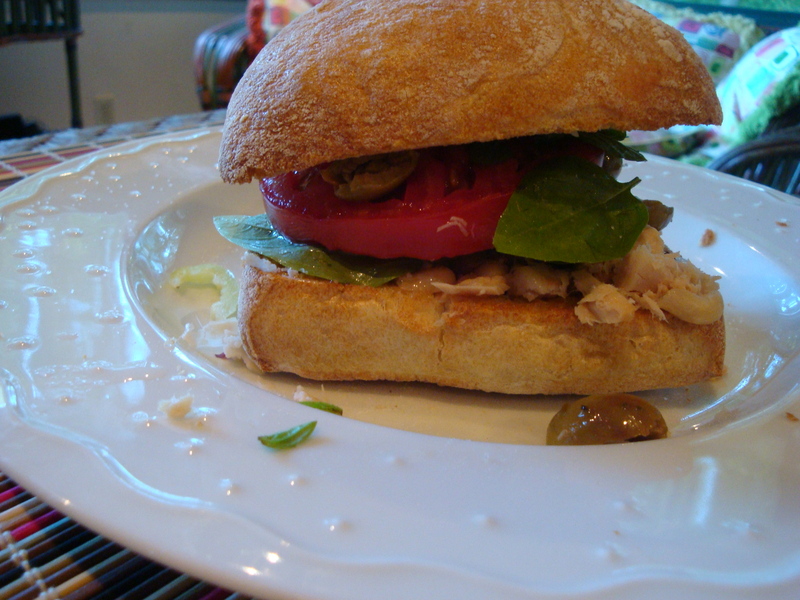 We agreed that we liked the ciabatta better, but both were good.